Before Women’s History Month concludes, Hearing Health Foundation (HHF) would like to highlight the accomplishments of women in science, technology, engineering, and mathematics (STEM), including those who have been instrumental to our own progress toward preventing, treating, and curing hearing loss and related conditions. Historically, STEM has been majority male, but the growing inclusion of women in the industry is closing the gender gap. In fact, LinkedIn reports the percentage of women entering STEM roles in the last four decades is greater than that of any other professional sector. In 1978, the STEM workforce was only 10% female, while today about a third of this field is comprised of women. 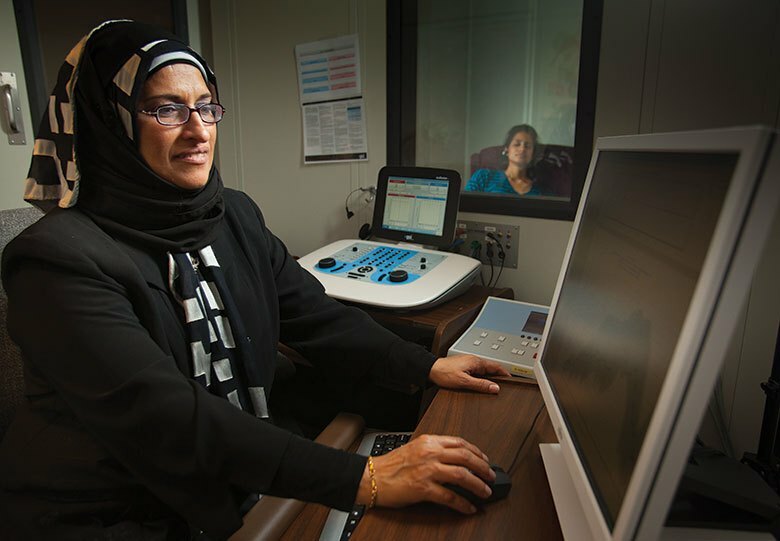 Emerging Research Grants (ERG) recipient Dr. Wafaa Kaf administers a hearing screening. Credit: Missouri State University. As individuals and as an organization that values inclusiveness, we all at HHF applaud the trend of growing opportunity for women in scientific professions, while remaining equally grateful to the male researchers and Board members who offer their commitment, support, and expertise. Our founder was a woman; 60 years ago, Mrs. Collette Ramsey Baker began a quest to find better treatments and cures for hearing and balance conditions which is championed by all today. We would like to acknowledge the outstanding women on HHF’s Board of Directors, whose altruism and intelligence have furthered hearing research and HHF’s growth. Our Board Chair, Elizabeth Keithley, Ph.D., who has been an auditory researcher for more than 30 years, began her association with HHF as a grant reviewer. Dr. Keithley has conducted and published a number of studies related to the mechanisms of inflammation and aging on the inner ear. From left: HHF Board Chair Elizabeth Keithley, Ph.D., and Board member Judy Dubno, Ph.D.
Board member Judy Dubno, Ph.D., professor at the Medical University of South Carolina, is considered one of the most important otolaryngology researchers in the nation. Her work has focused on auditory perception, hearing loss, and speech recognition. Dr. Dubno was also a contributor to the report that successfully urged the FDA to create a category of over-the-counter hearing aids to make hearing loss treatment more accessible to American adults. Also serving on the Board is Ruth Anne Eatock, Ph.D., of the University of Chicago, who studies sensory signaling by hair cells and neurons in the inner ear. She was recently published in The Journal of Neuroscience for her investigation of inner ear sensory cells in rodents. HHF is also thankful for the three female scientists who are part of our Hearing Restoration Project (HRP) consortium working to permanently cure hearing loss: Ronna Hertzano, M.D., Ph.D., Tatjana Piotrowski, Ph.D., and Jennifer S. Stone, Ph.D. Their labs at the University of Maryland, Stowers Institute for Medical Research, and the University of Washington, respectively, have uncovered valuable insights related to a biological cure for hearing loss. Our Emerging Research Grants (ERG) program has empowered many brilliant, female researchers, including those recently published: Wafaa Kaf, Ph.D., researching new techniques to diagnose Ménière's disease; Michelle Hastings, Ph.D., investigating early genetic intervention for Usher syndrome; Elizabeth McCullagh, Ph.D., examining the connection between sound localization difficulties and Fragile X Syndrome; and Samira Anderson, Au.D., Ph.D., working to improve hearing aid fit to enhance usage. Finally, we are fortunate to have Nadine Dehgan serving as our CEO. Ms. Dehgan plays a crucial role in our growth and programming efficiency, and her leadership experience and passion for how hearing science can better people’s lives has made her a strong fit to drive HHF forward. HHF deeply values the work of all individuals who bring us closer to a world without hearing loss and tinnitus. For Women’s History Month, we’re honored to call special attention to the women who have been part of these life-changing efforts in the spirit of Mrs. Ramsey Baker, whose determination and selflessness still inspires us today.